Even with improvements in dental care, many Americans suffer tooth loss — mostly due to decay, periodontal disease, or injury. For many years, the primary options available for people with missing teeth were bridges and dentures. But, today, dental implants are available! Implants are an effective, long term solution to replace missing teeth. Designed to feel as strong as your natural teeth, implants are a small apparatus constructed primarily of titanium that are surgically placed in the upper or lower jaw, and they serve as the sturdy base for replacement teeth. 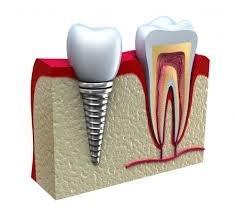 Dental implants can be used to support single crowns, bridges, or even dentures!